Keeping your child’s teeth clean and healthy is a constant daily chore. Without regular flossing, brushing and dental visits, the health of your child’s teeth can decline at a rapid rate. Getting your kids to learn healthy habits when it comes to dental care is a long term investment that will greatly benefit your wallet and their oral health. While cleaning their teeth and having regular appointments with the dentist are important, there are also other ways to protect your child’s teeth. One of the most common activities that results in tooth damage is contact sports. While sports is a great way to teach your child life lessons, specific precautions must be taken to protect your child. Football players wear helmets and pads, baseball players wear a helmet at bat and soccer players wear shin guards during their match. These are all excellent pieces of protective equipment that make each sport safer to play for your child. 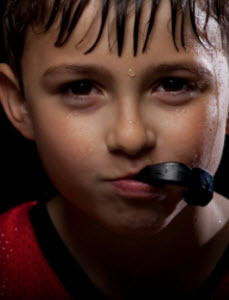 Mouth guards are a necessary piece of safety equipment for your child to wear during the time they are actively playing a sport. You may notice more and more athletes using a mouth guard today. Football is a common sport where mouth guards are worn, not only do they protect the teeth, but they have been proven to help fight against concussions as well. Basketball is a sport where mouth guards were not very common, however, when you turn a game on today, you will see the most popular players wearing a mouth guard during their time on the court. A few years ago a dental newsletter was published that mentioned a boy snagging his teeth on the net of a basketball hoop while attempting a slam dunk. After the article appeared nearly 40 more dentists wrote that they had seen the same situation in their own office. Usually a sports injury that involves teeth ends up damaging at least one of the two front teeth. It is estimated that between thirteen and thirty nine percent of dental injuries occur while playing sports. Wearing a mouth guard is a great way to help protect your child’s teeth while they are involved in sports. You may also want to look into upgraded helmet protect. Baseball helmets now offer a face guard that will help protect your child’s face while they are up to bat. Take every precaution you can find to keep your child’s teeth from being harmed during their sporting activity. Contact Smile Reef if your child has experienced tooth damage while playing sports. Our children are most often our main priority and generally most parents put the needs of children ahead of their own. It especially eats at us when our kids fall ill, get a boo-boo on the playground, or even when a pesky canker sore makes itself known. What is a Canker Sore in the Mouth & What Causes them? So what is a canker sore? Canker sores appear as small white swellings or sores surrounded by an area of redness. Canker sores are found on the gum line, under the tongue, on the cheeks and lips. Canker sores are not contagious. They do seem to recur, and come about to be minor or small, sometimes large, and now and again can be multiples usually clustered together. Canker sores can be painful and make eating or drinking unbearable. It is unclear what actually causes canker sores although most medical experts agree that it is either bacterial or viral involving the immune system. It is also presumed factors such as stress, vitamin or iron deficiency, trauma, allergies and heredity might contribute. Children and teenagers seem more susceptible than adults. Sometimes people confuse canker sore with cold sores. Canker sores only appear in the mouth, where cold sores generally emerge on the lips, or outside the mouth. Cold sores are contagious, and painful coming from the herpes virus. Canker sores generally heal within seven-ten days, however recurrent outbreaks are common. Typically canker sores do not need prescription medication and an over the counter pain reliever is recommended if it gets too painful. If a canker sore lasts longer than two weeks and it has become too painful for your child to eat or drink, contact a doctor. –	Avoid eating abrasive, salt foods too often. Snacks like chips and nuts can irritate the gums and delicate mouth tissues. Especially if a canker sore is present, it may be a good idea to skip those salty treats. –	Avoid foods that your child may have even minor allergies to. Spicy, salty and acidic foods should be avoided during a canker sore breakout as these foods can contribute to irritation and lead to pain. –	Have your child brush their teeth and use mouthwash with products that do not contain SLS (sodium lauryl sulfate). –	If your child seems to get canker sores on a regular bases, try switching to a toothbrush with softer bristles and avoid scrubbing too hard. Although canker sores can be a pain, both figuratively and literally, our children will learn how to deal with them, and what to avoid until those tiny nuisances go away. Smile Reef Pediatric Dentistry has the expertise to get your child to a healthy mouth and dazzling smile. If you have any questions or concerns about canker sores, we can consult with you on your child’s next visit.